To prepare the combat air forces, joint and allied aircrews for tomorrow’s victories with challenging and realistic threat replication, training, academics and feedback. 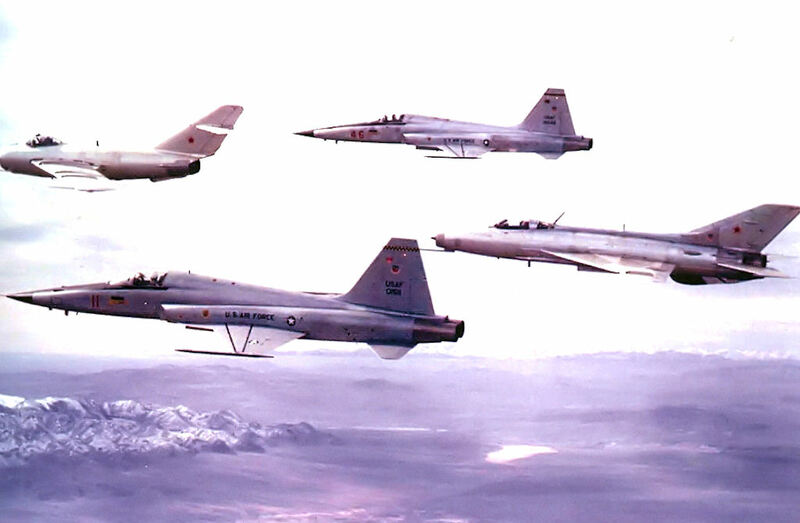 USAF aggressor squadrons were first established in 1972 following the high air combat loss ratio during the Vietnam War. 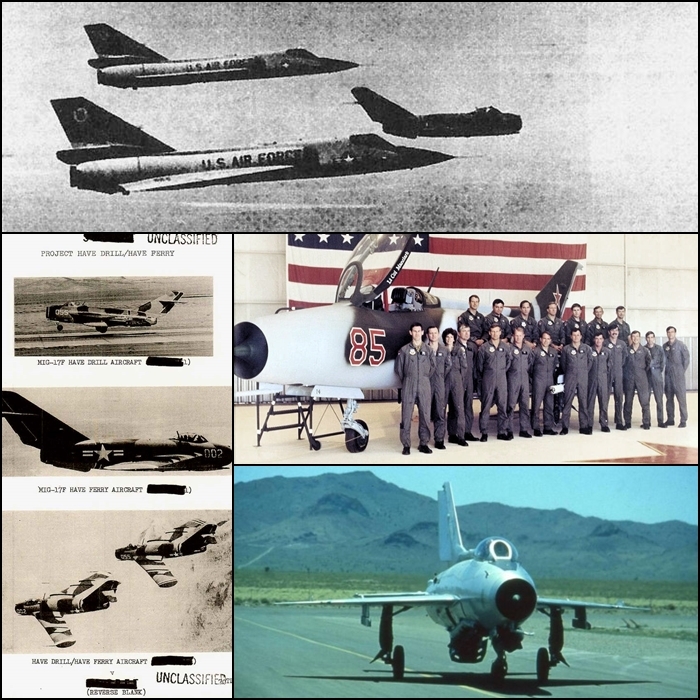 According to the USAF, air to air victories were at a ratio of 10:1 during the Korean War (1950-1953) but at the lowest point during the Vietnam War (1961-1973) had dropped to almost 1:1 against North Vietnamese fighters! This was naturally unacceptable and insufficient training in flying basic fighter maneuvers was determined as a significant cause. 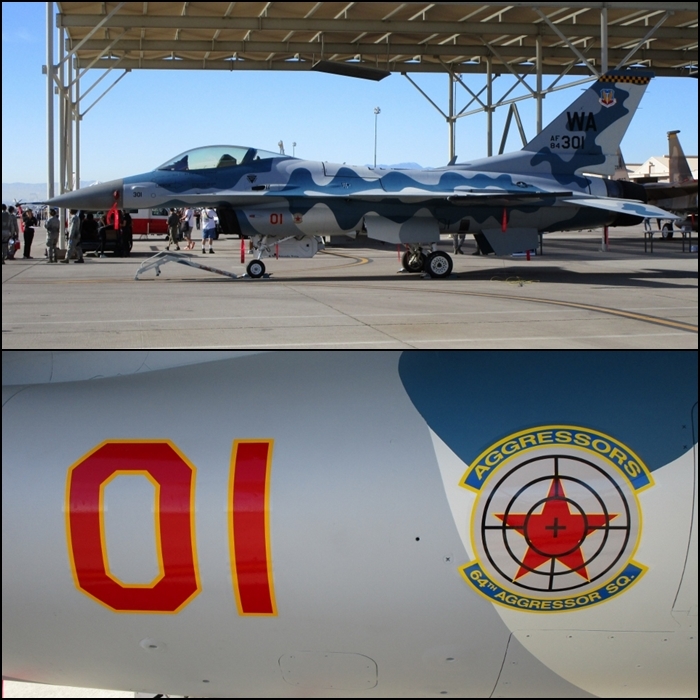 USAF Aggressor squadrons were established to provide a realistic adversary in combat training (the US Navy and US Marine Corps operate similar training programs). 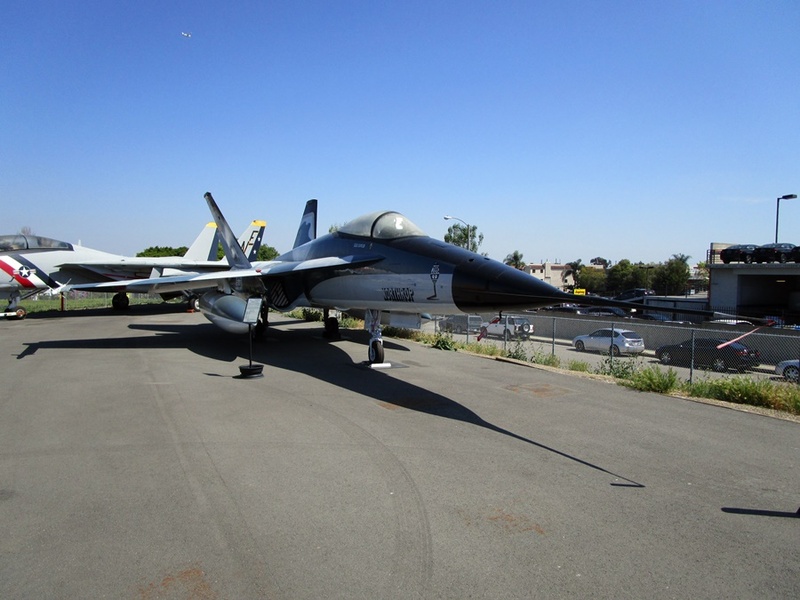 The first in 1972 was the 64th Fighter Weapons Squadron manned with seasoned pilots from the Vietnam War. They would employ known tactics of the Soviet Union and other potential adversaries and act like the enemy aircraft. 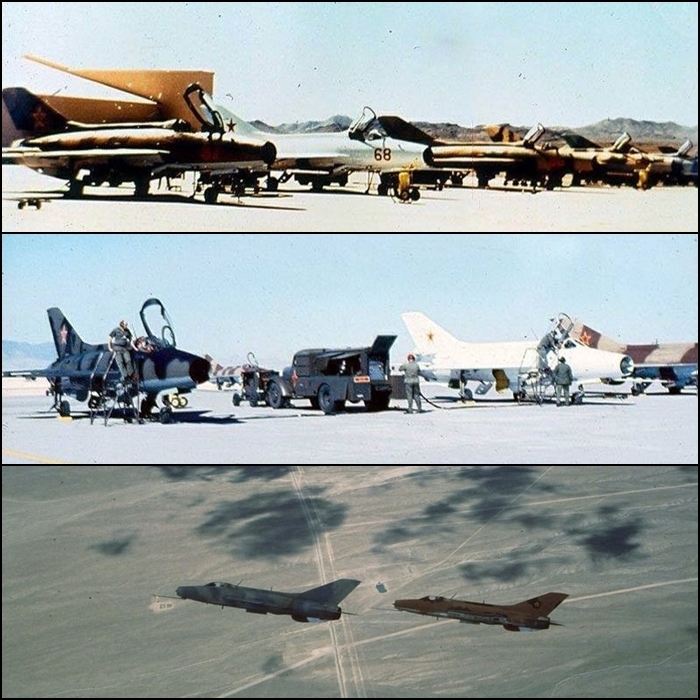 In 1975 the 65th Fighter Weapons Squadron was formed along with two other aggressor squadrons, the 26th Tactical Fighter Training Squadron in the Philippines and in 1976 the 527th Tactical Fighter Training and Aggressor Squadron in the UK. 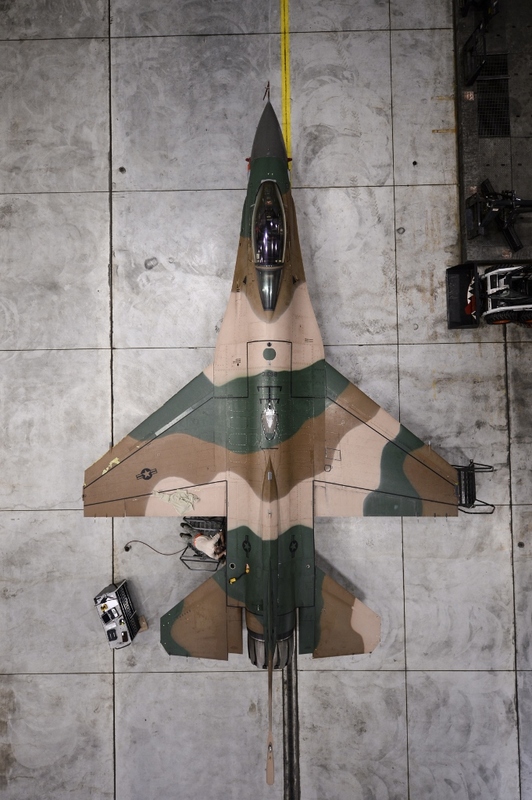 Initially the aggressors flew the Northrop T-38 Talon training aircraft, but with the fall of South Vietnam in 1975, surplus Northrop F-5E Tiger II fighter aircraft intended for that country replaced them. 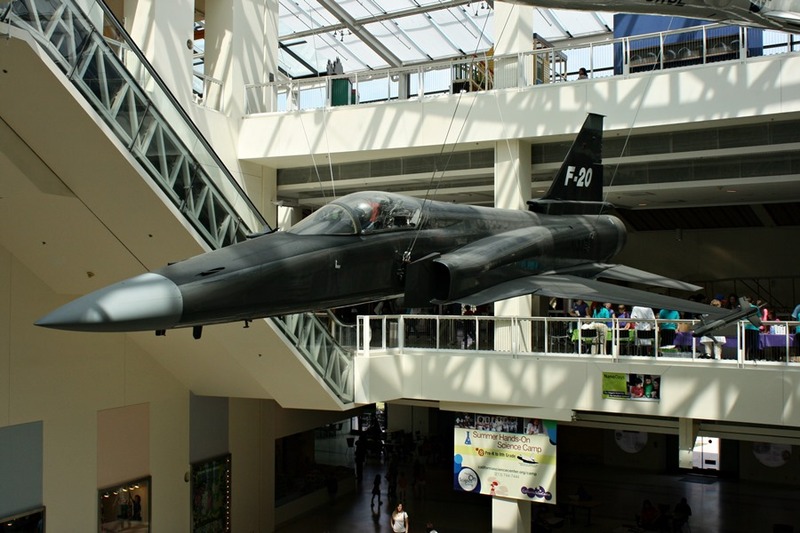 The F-5E was ideal due to its small airframe size and performance similarities to the Soviet MiG-21 fighter (although the Soviet fighter was much faster). 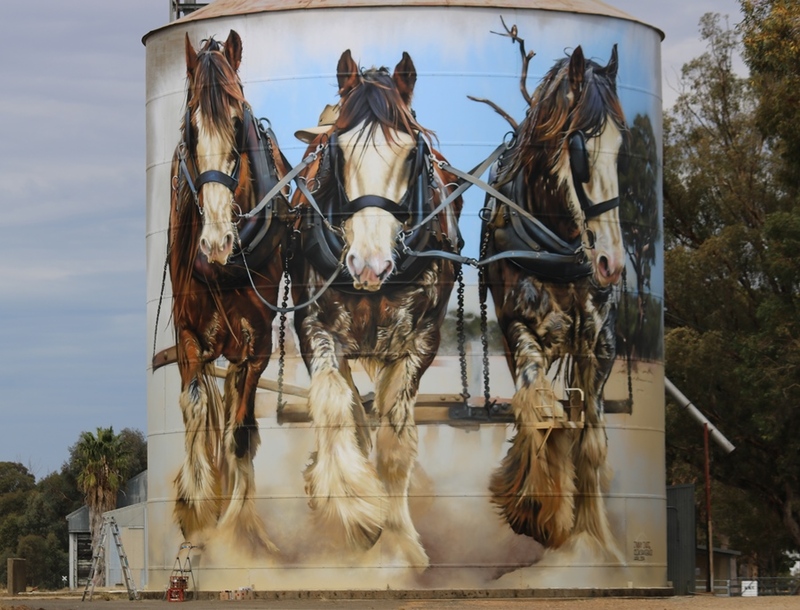 They were painted in Eastern Bloc and Soviet style paint schemes to add to the realism. 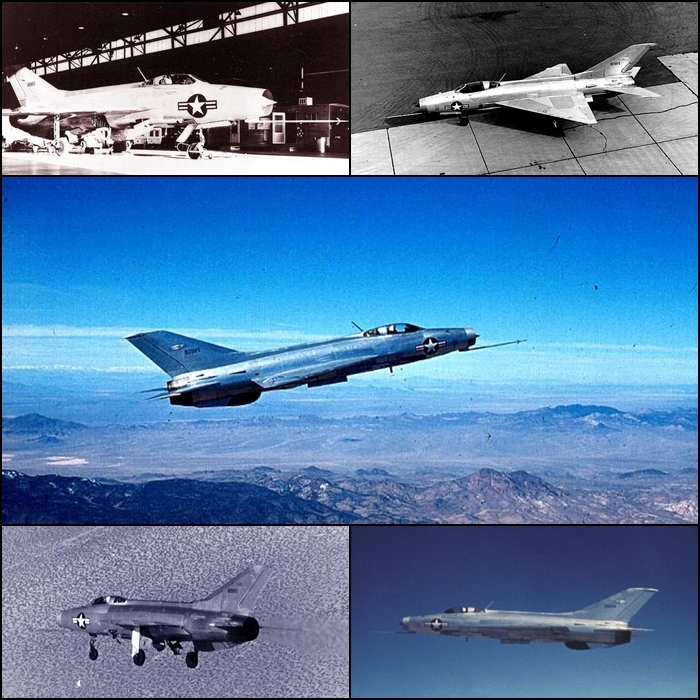 Between 1977 to 1988 the 4477th Test and Evaluation Squadron (established in 1977) even operated some Soviet aircraft types such as the Mikoyan Gurevich MiG-17 Fresco (F and PF variants), MiG-21 Fishbed (F-13 and MF variants) and MiG-23 Flogger (BN and MS variants) fighters for air combat training at the Tonopah Test Range in Nevada. 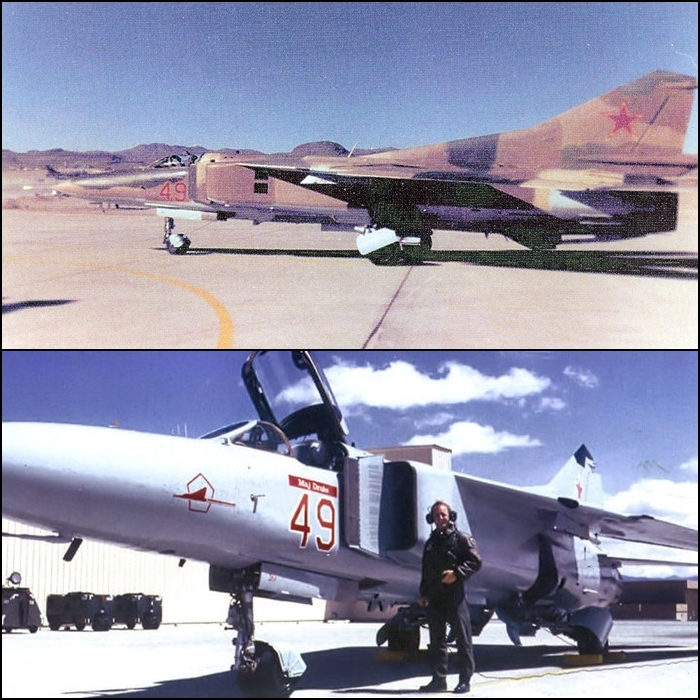 These MiG aircraft were obtained through various sources including aircraft captured by Israel along with aircraft sold by Egypt and Indonesia. 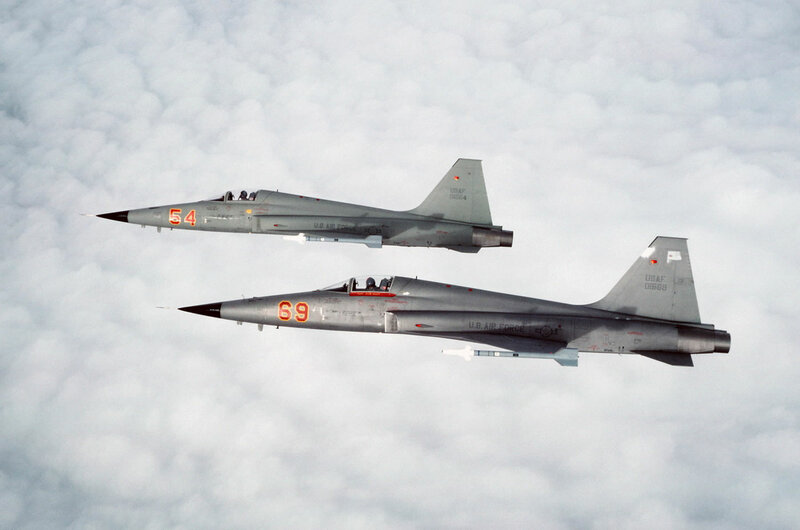 The USAF also purchased 12 Chengdu / Shenyang J-7B fighters (a MiG-21F-13 variant) from China in 1987. Operating actual Soviet era aircraft no doubt increased the value and realism of the aggressor training. 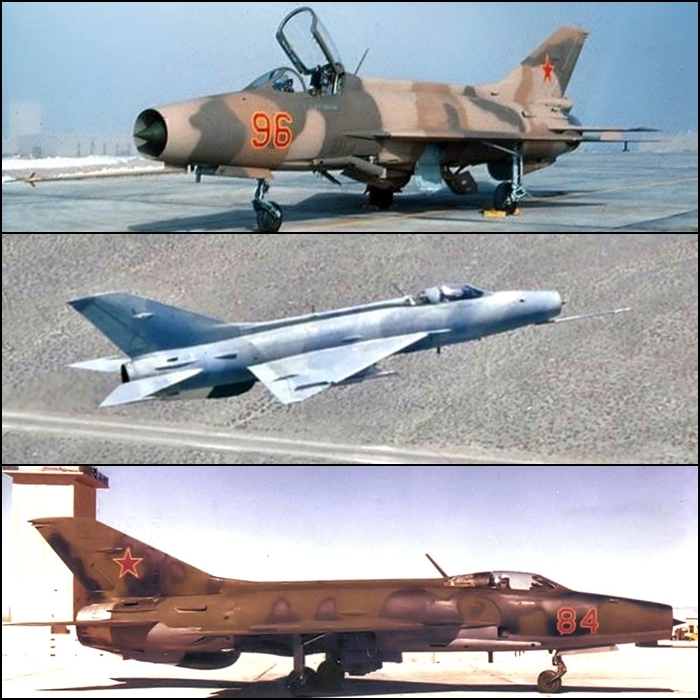 3 MiG’s were lost in accidents during this period: a MiG-17F in 1979 and 2 MiG-23’s, one in 1982 and another in 1984. 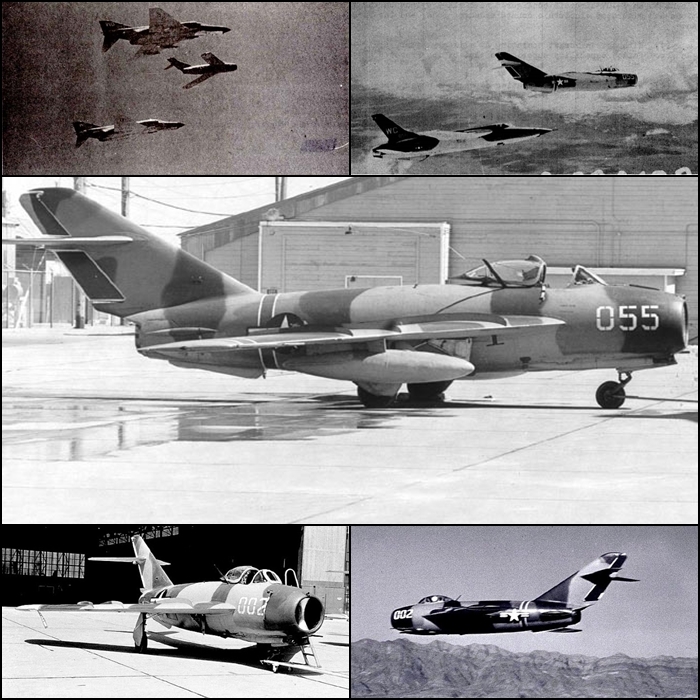 The accidents resulted in the sad loss of 2 pilots from the 4477th (1979 MiG-17F crash – pilot: U.S. Navy Lieutenant M. Hugh Brown and 1984 MiG-23 crash – pilot: USAF Lieutenant General Robert M. Bond). 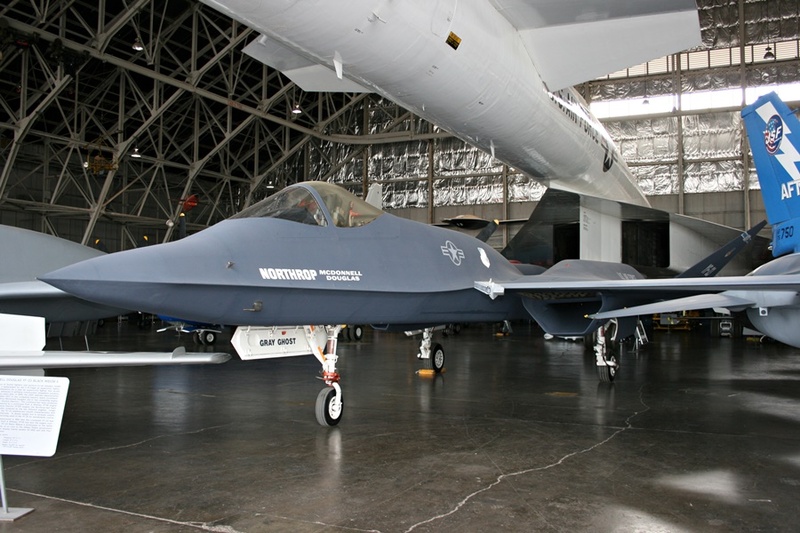 With the winding down of the Cold War and the subsequent disbandment of operations in 1988 (operating and maintaining a limited number of foreign aircraft types was expensive), the MiG aircraft of the 4477th Test and Evaluation Squadron were either scrapped or sent to museums for static display. 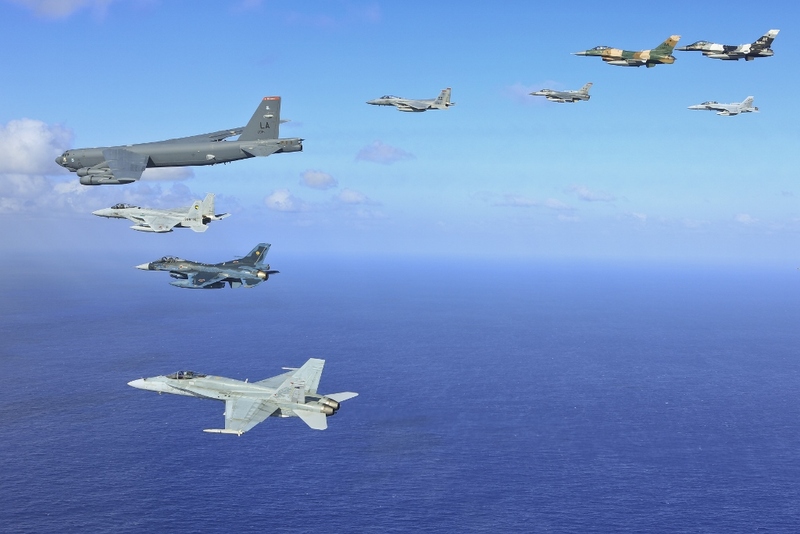 With the end of the Cold War and budget restraints all USAF aggressor squadrons were actually disbanded in 1990 with the role undertaken in a reduced manner by the Adversary Tactics Division under the 414th Combat Training Squadron during Red Flag exercises. 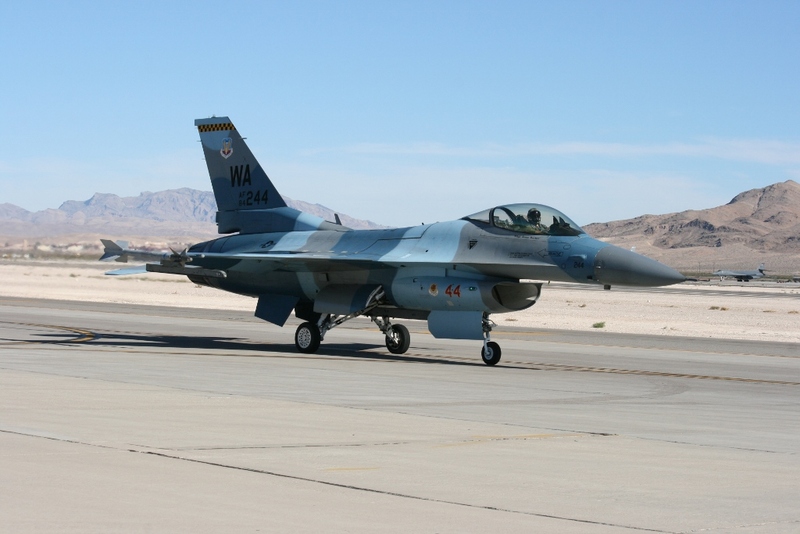 The needs of strenuous combat training though resulted in the USAF 64th Aggressor Squadron and 65th Aggressor Squadron being reinstated in 2003 and 2005 at Nellis AFB. 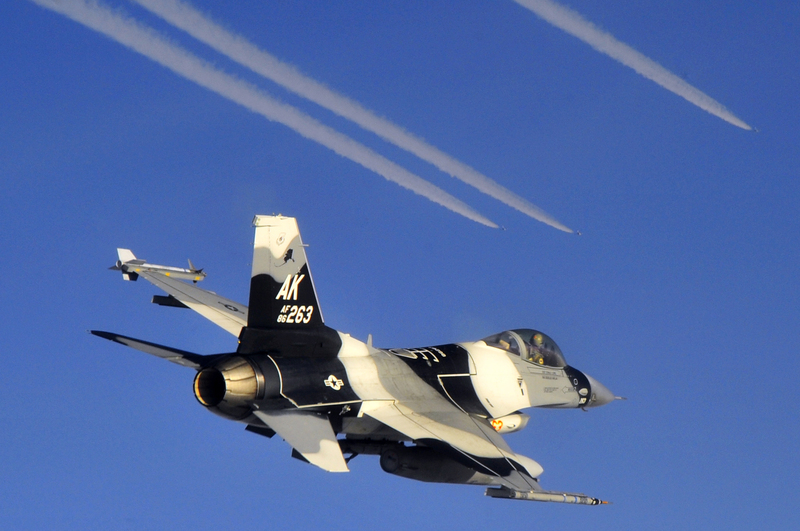 Similar aggressor training is conducted in Alaska by the USAF 18th Aggressor Squadron at Eielson AFB near Fairbanks. 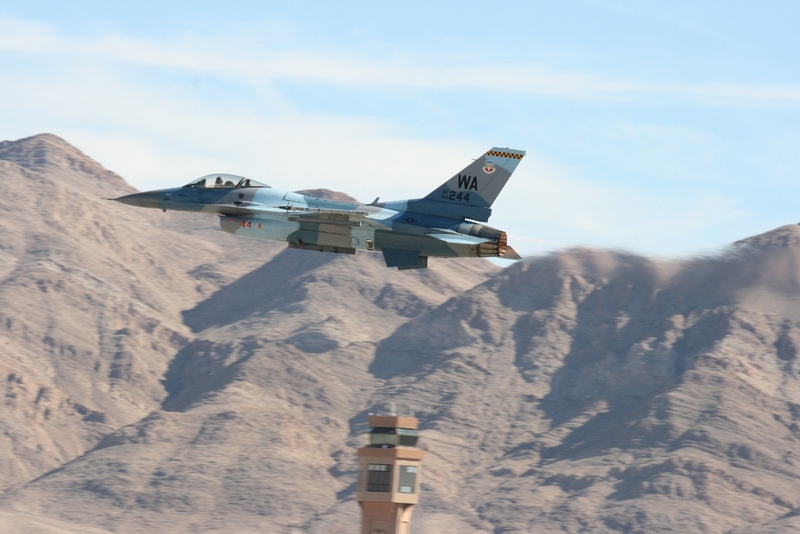 The aggressor squadrons conduct training with not only the US military but also with allied and coalition partners. 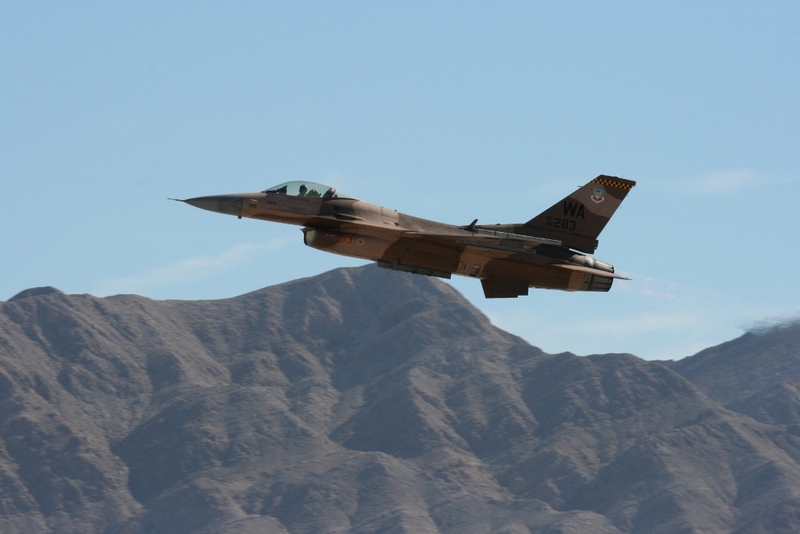 Ongoing aggressor training has enabled the USAF to maintain an air combat edge over their adversaries. 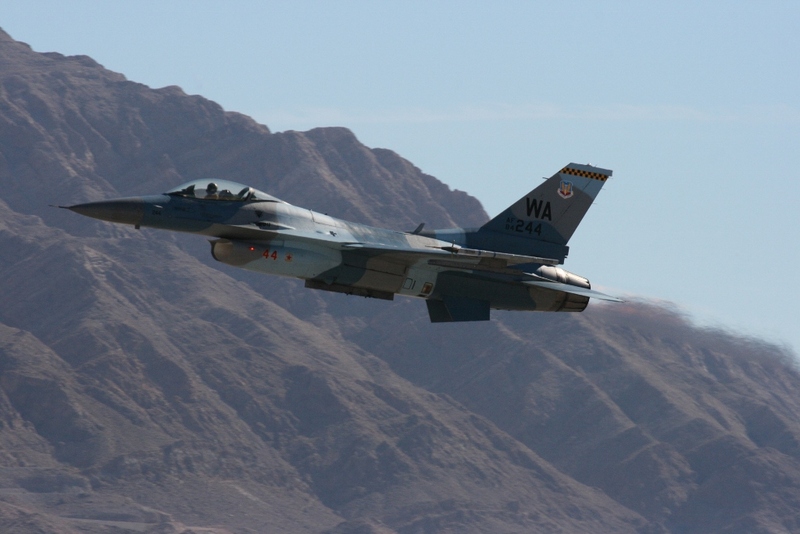 Since the Vietnam War the USAF has not been seriously tested in air-to-air combat and they have dominated in air superiority in the limited air wars over the Former Yugoslavia in the 1990’s and the Middle East mainly from 1990 to 2003 (alongside US Navy, USMC and NATO / coalition partners). 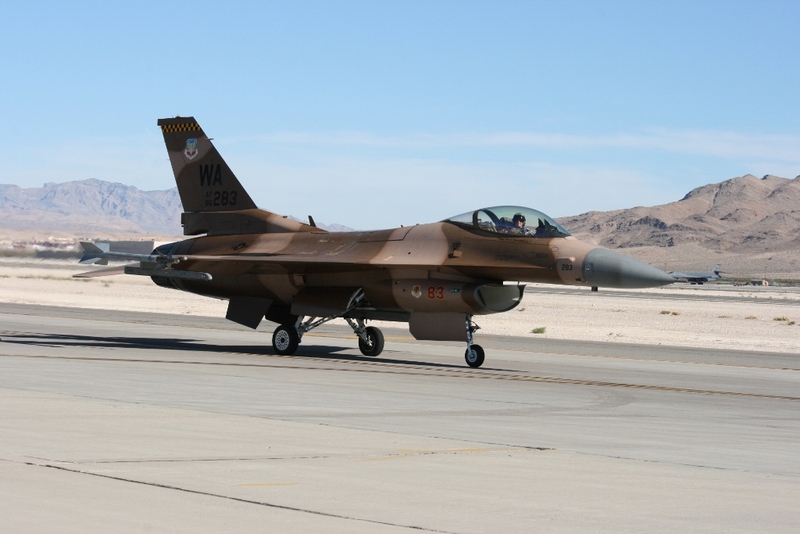 Today the aggressor squadrons fly more modern combat aircraft in the General Dynamics F-16C Fighting Falcon (Viper) and McDonnell Douglas F-15C/D Eagle to simulate more advanced fighters flown by potential adversaries. 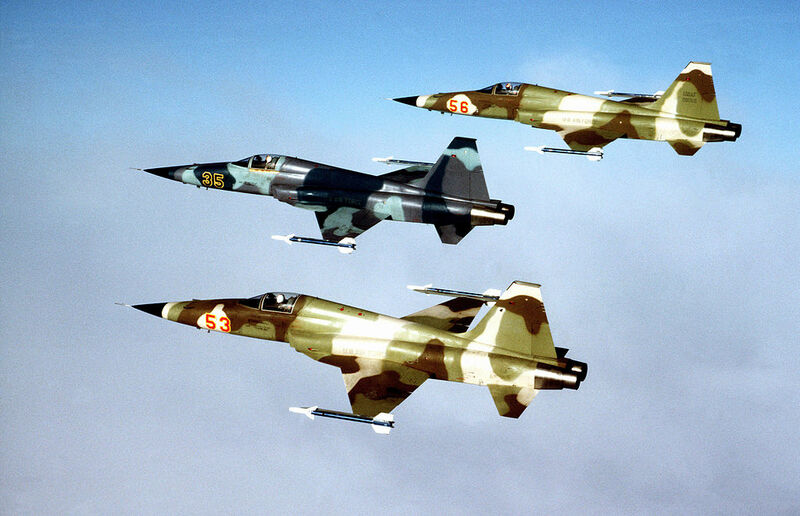 These fighters are painted in unique colour schemes similar to aircraft in overseas air forces that are not aligned with the United States. 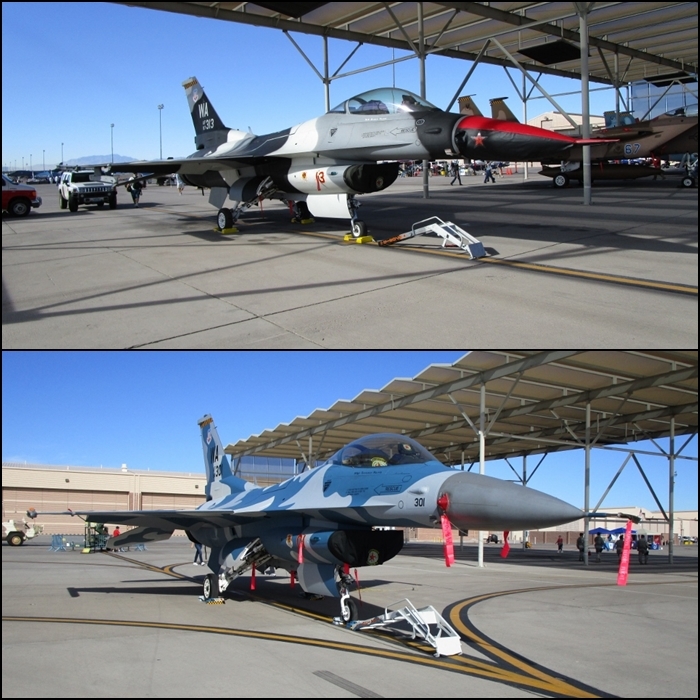 At Aviation Nation 2014 at Nellis AFB a number of these aggressor aircraft were on static display and also took part in a tactical air demonstration. It was good to see the “bad guys” in action! 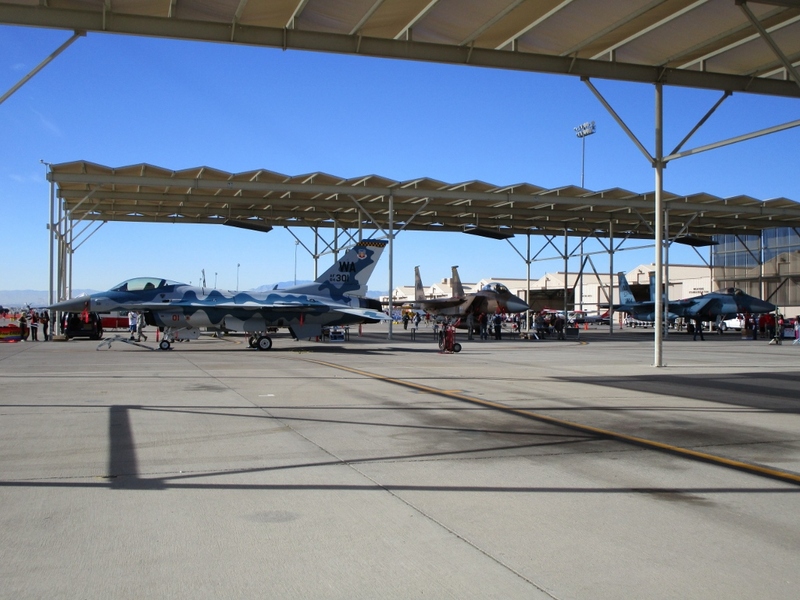 In September 2014 it was announced that due to budget constraints the 65th Aggressor Squadron was to be disbanded by October 1st, 2014 with some of the 19 F-15C/D’s temporarily being transferred to the 64th Aggressor Squadron before being transferred elsewhere or retired (scheduled to occur by April 2015). This seems a strange decision as the F-15 is a perfect emulator of the large Sukhoi fighters such as the Su-27 and Su-35 Flankers. 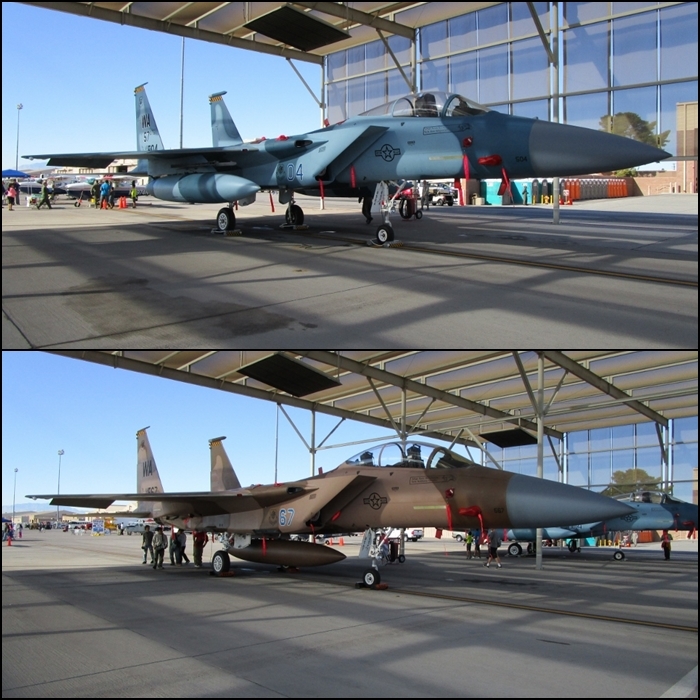 Aviation Nation was in November 2014 and F-15C/D fighters were on display so hopefully they will be retained for a bit longer to continue to provide valuable adversary training. 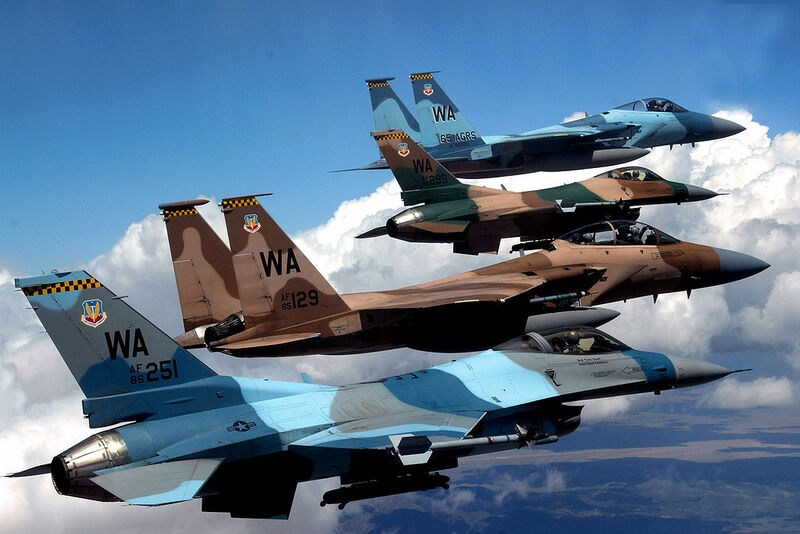 So with the demise of the 65th, this leaves the 64th Aggressor Squadron with 20 F-16’s and a small number of F-15’s to soldier on along with the 18th Aggressor Squadron with around 20 F-16 aircraft, as the only USAF aggressor squadrons. 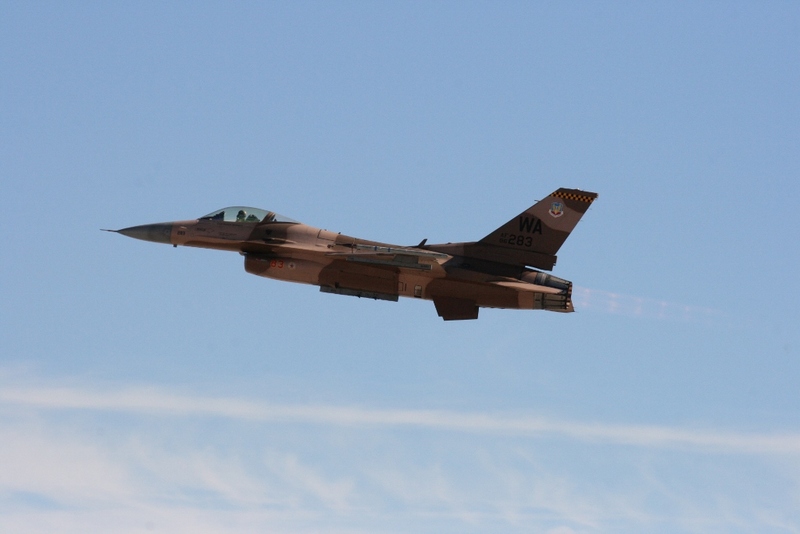 They will continue to provide a training program that provides the USAF and her allies with a competitive edge in air combat. 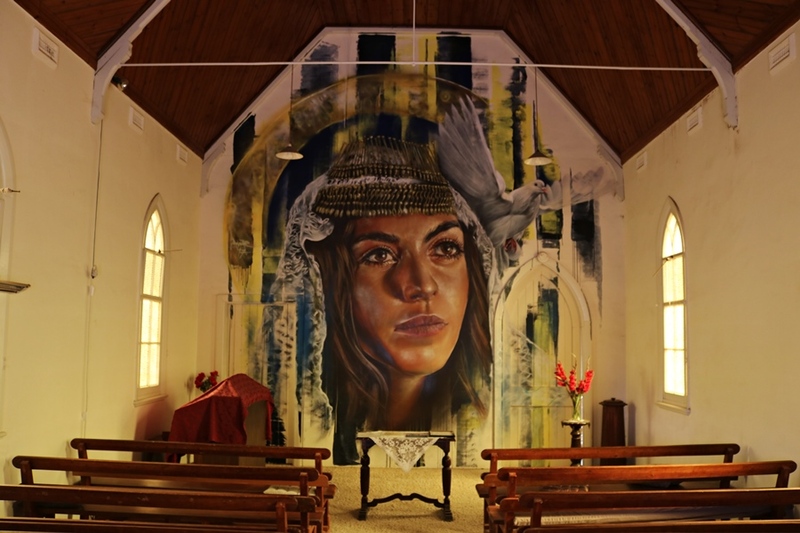 Fabulous photos there. 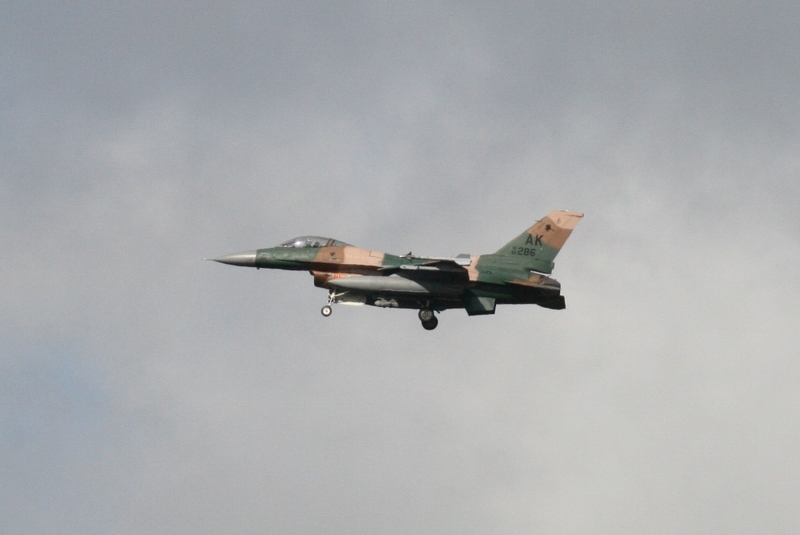 I didn’t realise Lakenheath had an aggressor Sqn! Thanks for sharing. 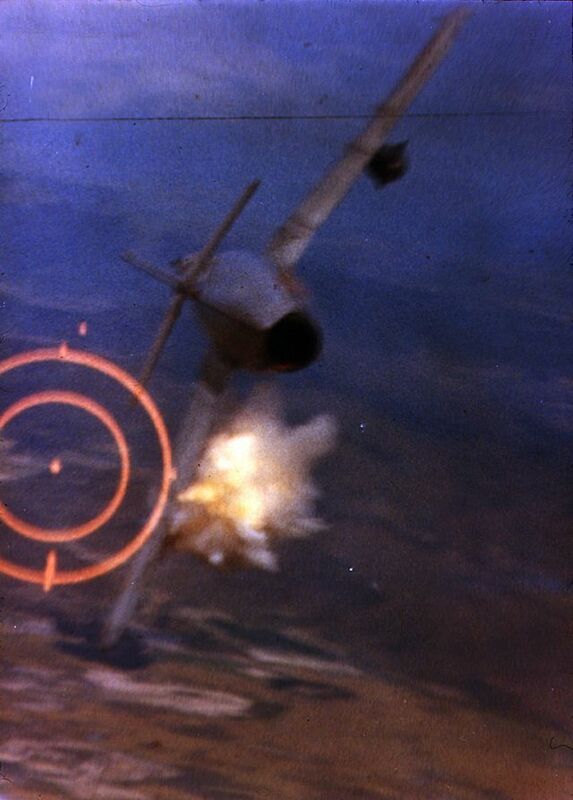 If I was the pilot of the captured MiG I’d personally make sure that every USAF pilot within 500 miles had been informed before I climbed into the cockpit. Not saying that I couldn’t trust my fellow pilots, but it never hurts to be absolutely sure in these circumstances. Ha ha yeah better safe than sorry you think?